SpeedInfo provides the most cost efficient and accurate system for measuring traffic in the country. 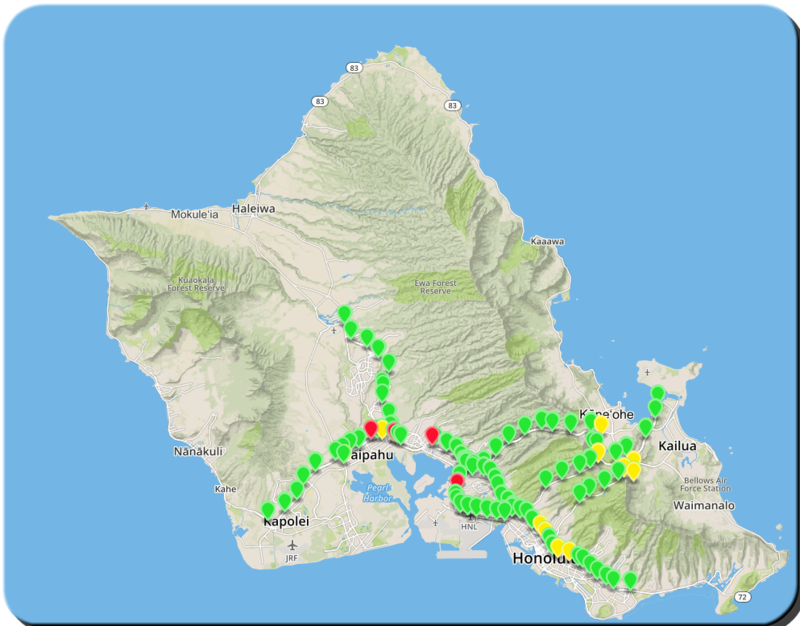 State and local Departments of Transportation (DOTs), Metropolitan Planning Organizations, Mass Media Organizations, Traffic Aggregators and Mobile Application Developers all benefit from using our data, as do the rest of us that use the roads every day. can be deployed with an optional camera. Both sensors are usually attached to existing infrastructure such as light or sign poles, and data backhauled via a wireless modem to our cloud-based servers. The data is streamed to our customers via a secure, private XML link. Our customers use SpeedInfo data for highway operations, reducing traffic congestion, and empowering drivers with real-time traffic information. Our sensors have been deployed throughout the USA and in Asia. Headquartered in San Jose, California, SpeedInfo is a venture funded, small business enterprise. SpeedInfo's real-time traffic flow data service includes three elements: the company's patented (US patent #7558695 B2), innovative solar-powered radar sensors, wireless communications via the AT&T Wireless network and data customization and dissemination through the company's proprietary hardware and software. Combined, these elements provide SpeedInfo partners the most accurate, reliable and low cost traffic flow information available. Solar: Our sensors are solar powered, with an integral battery backup and a Wireless data connection. They can go virtually anywhere. Very Low Power: Our sensors are designed from the ground up to use very little power. This lets us minimize the size of the solar panel and battery, and lets us install on existing infrastructure without the need for additional poles. Cloud-based servers: Our servers are based in the cloud, offering higher reliability and uptime to our customers. Active Network Management: In the Internet-of-Things space, remote sensors are notoriously difficult to manage. If a sensor goes down, there is little that can be done to fix it without going out to replace it. Our sensors have multiple layers of embedded code that detect network outages and repair them automatically, reducing maintenance and improving uptime. Two data feeds: Customers can access their data two ways. We offer an online dashboard to let them drill into current conditions for the sensor of their choice. And we stream data directly to their database via a secure XML feed. 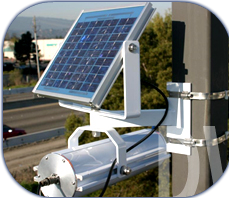 The DVSS-101 Traffic Speed Sensor is a low-cost Doppler radar sensor that measures traffic speed in both directions. It cannot be used to give speeding tickets &hyphen; we can tell if someone is going 100 mph, but we can&apos;t tell who it might be. The sensor sends a radar pulse out every 15 seconds, and breaks down the return signal into approaching and receding directions, and then separates each direction into 0.1mph speed bins from 0 to 100mph (1000 bins in total). It averages the speeds it detects, and transmits the speed in each direction once a minute. When precipitation is falling, the sensor filters out the precipitation and only reports vehicle speeds. The Count+ Traffic Count Sensor is a passive infrared device that can be configured to monitor traffic in up to 4 lanes, in one or two directions. It provides a lot of different types of data: vehicle speed, classification, and counts by lane, and lane occupancy rates. 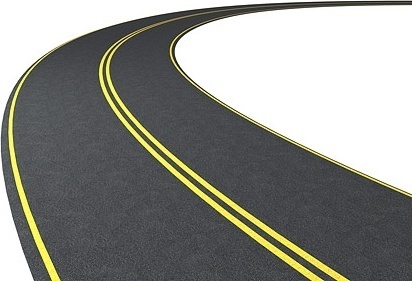 In addition, the sensor&apos;s passive infrared detector measures road surface temperatures. This can be a big benefit in areas where snow removal is a big issue. Knowing where the snow is melting and where it is not can help the DOT deploy its resources more efficiently and save money. The Count+ Sensor can be configured with an optional camera if so desired. Traffic cameras are very expensive, requiring high speed data connectivity and lots of power. Our camera is designed to provide pictures on demand or when conditions warrant. Because it is not running continuously, it is not a serious power user and can transmit pictures over a conventional cellular link. 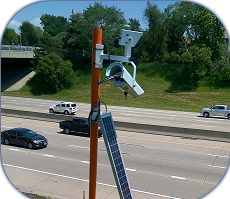 Traditional traffic video cameras can cost hundreds of thousands of dollars to bring the requisite infrastructure to the site. No more. 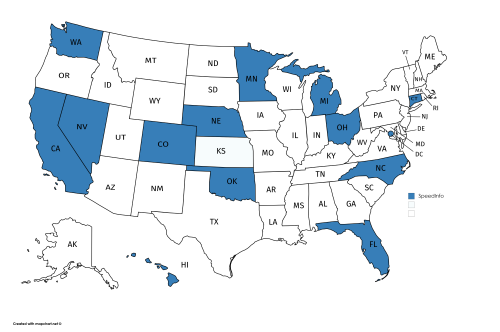 The Federal Government now requires active monitoring of work zones to make sure that reduced speed limits are observed. Salander is one of our customers who uses SpeedInfo DVSS 101 sensors to measure speeds in the work zone. The data is flashed on changeable message signs and warns drivers to slow down when it is appropriate, reducing road worker fatalities. When the contract requires vehicle counts as well as speeds, our customer can install a Count+ sensor at the beginning of the work zone, and speed sensors everywhere else. This provides all the data required under the contract at a low cost, and provides the added benefit of measuring road surface temperatures and video monitoring too. We call it "speed everywhere, count where you need it". Doug Finlay is Founder and Chief Executive Officer of SpeedInfo. The company has developed a highly-accurate and cost effective approach for measuring traffic flow, based on attaching a wireless, solar-powered Doppler radar to light or signage poles. SpeedInfo customers include State Departments of Transportation, mass media organizations (such as news organizations that report traffic), traffic aggregators and mobile applications developers. Doug conceived the idea for SpeedInfo from two previous startups with which he worked &hyphen; Keynote Systems and MapInfo. Prior to founding SpeedInfo, Doug served in financial positions for several start up ventures. From 2000-2001, he held the Chief Financial Officer position of ADX, a business-to-business automation software company. From 1997-1999, Doug served as Chief Financial Officer for Keynote Systems, an Internet infrastructure start up, leading the company's efforts to complete an IPO. Before that from 1982-1997, Doug held various positions with MapInfo, Legent, Oracle and NEC. Doug is a frequent commentator in a wide range of business and trade publications, including Red Herring, GPS & Wireless News, and Directions Magazine. Doug holds a B.S degree in Computer Science from the University of Illinois at Urbana and a M.S in Operations Research from Stanford University. Glenn Harter is Director of Business Development at SpeedInfo. In this role, he is responsible for Sales and Marketing of SpeedInfo's Speed Sensor and Count Sensor to Transportation Agencies across the globe. Before joining SpeedInfo, Glenn was the Senior Sales Representative with Peek Traffic selling Traffic Monitoring Products into the same customer base. Since leaving the Unites States Air Force in 1992, Glenn has moved his way up from IT Tech, to Field Service Tech, to Sales Engineering, to Sales allowing him to use his Technical experience to better understand the needs of the customer and to create long lasting relationships with customers on several different continents.